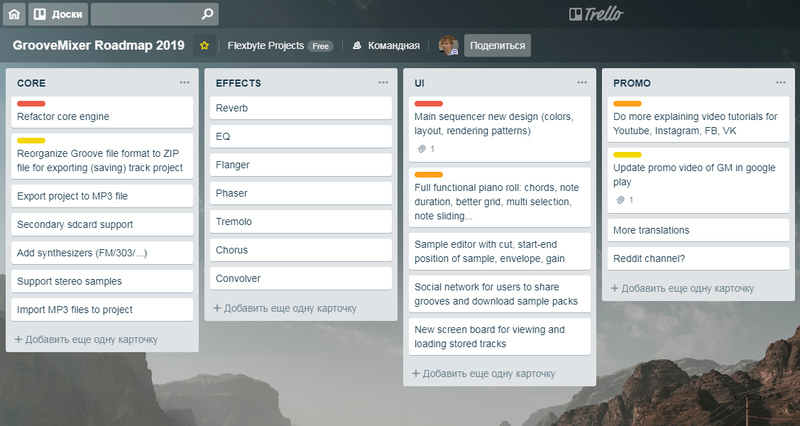 I’m very happy to announce the development roadmap of Groovemixer app in this year. Before I start, let me remind what Groovemixer is. Groovemixer is a pocket beat maker for Android with drum machine, audio recorder and simple piano roll. It allows you to create music beats and mix loops anywhere anytime. Groovemixer is available for free download at Google Play. For more information, please visit the official site. My competitors are very good. They have good and attractive design. So I want to redesign my app to be more competitive in the market, of course, I will try to not kill the best things. New piano roll is the next reason why I need to modify the app design. I want to support chords, note duration, flexible grid with ability to change note offset, multi selection, note sliding and more features. We also need sample editor to chop imported loops and samples with supporting gain, changing start-end position of played samples and AR-envelope. What if you did a cool beat and you want to share it with other Groove Mixer users to get feedback from them or remixes? So the next step is to implement some kind of social network like Instagram/Soundcloud for groove makers where they can share groove files. With new design I want to change the idea of saving/loading projects. From one side, many of mobile users doesn’t know that “the floppy disk” icon means “Save”, from other side I want to prevent situations when the app is crashed and you lost the whole unsaved work or you get “corrupted file” message when open a project. And there is also the issue with how to share the saved/exported project with other users via third-party apps. There are a lot of changes I want to do. First of all, I want to make Groove file format open to every developer. New format is also important for new loading/saving/exporting paradigm I wrote above. There is a lot of feedback from you to add export and import MP3 files. The export to MP3 file will be released in the nearest update (I’m sorry, but it will be a paid feature; free alternatives are OGG/FLAC formats). The import of MP3 file will be added with sample editor later. In this year I want to add synthesizers, but I can do that when a new piano roll will be implemented, support of stereo samples (on current moment the app converts stereo channels to mono, as result the sound of sample plays different) and many sound effects: Reverb, EQ, Flanger, Chorus, Phaser and more. Thanks for reading. Your feedback is always welcome. Tell me what you think in comments or support me with clapping.